Len Berg's was an institution in Macon. Len Berg’s opened in the early 1900's, and it switched owners only a few times during the almost 100 years that the doors were open. Each time Len Berg's changed hands, the food remained consistently the best. People loved Len Berg's, and guests let everyone know it by pressing the buzzer on the way out to let the cooks know they liked their food. Prepare dry mix of corn meal, flour, baking powder, salt, sugar and powdered milk. Take ½ of this dry mixture and add eggs and Wesson oil. Mix well. Slowly pour in about 2 quarts cold water and mix well. Pour into greased cast-iron pans divided into sections for individual sticks of bread or into well-seasoned cast iron muffin pans. Bake 15-20 minutes or until brown on top. Chop 3 stalks of celery, 3 green onions, 1 large bell pepper, 1 medium Vidalia Onion and 2 tbs. of garlic; add to a stock pot with a tbs. of oil and cook until tender. Add 2 lbs. of ground chuck and brown. Before adding remaining ingredients, drain excess grease from ground chuck. Add one 15 oz. can of tomato sauce, one 15 oz. can of chunky tomatoes, two 10 oz. cans of Rotel, one 6 oz. can of tomato paste and one can of chili beans. Stir well and add 3 Tbs. chili powder, stirring again. Cover and simmer. If you prefer a spicier chili, add more chili powder to your liking. Mix above ingredients together. Beat stiff (but not dry) 3 egg whites and add 1 teaspoon almond extract. Fold egg white into dry mixture. Pour into a well-floured 9" pie plate. Bake 25-30 minutes in 350 degree oven. 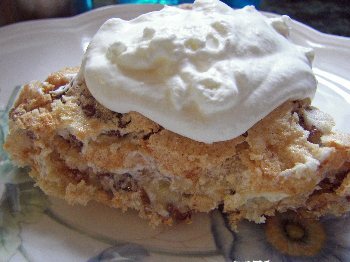 Serve with whipped cream or topping. Shuck and remove silks from 12 ears of corn. Hold an ear upright in a steady deep pan or dish and with a sharp knife, shave off kernels into the pan using the back of the knife blade scraping juices into the pan as well. In a large cast-iron skillet, melt 3 tbs. of butter over low heat and stir in a small amount of flour or cornstarch to make a thin roux; add salt and pepper to taste. Add the corn kernels to the pan and cook over low heat for 10-15 minutes. Cut short ribs into portions and place into a roasting pan with 2 cups of water, cup of apple cider vinegar, salt and pepper. Cook until brown in oven, about one to two hours. Drain off all grease and pour BBQ sauce over ribs before serving. The BBQ sauce is one quart of a well-blended mixture: ketchup, vinegar, hot sauce, Worchester shire sauce, salt and pepper. Let simmer on stove top for 1 hour and pour onto ribs before serving.